What a night at the Scotiabank Saddledome on Tuesday. Ten days after the building's primary tenant held one hell of a party in game 6 against the Vancouver Canucks, the Calgary Flames were back at home again and with 19,289 guests packed into the joint, they held another epic bash that everyone's going to be talking about for some time. Man, quite a reputation this young Calgary team is forging. For a recap of the game itself through the eyes of your good friends from The Canadian Press, my colleague Donna Spencer crafted the game story. 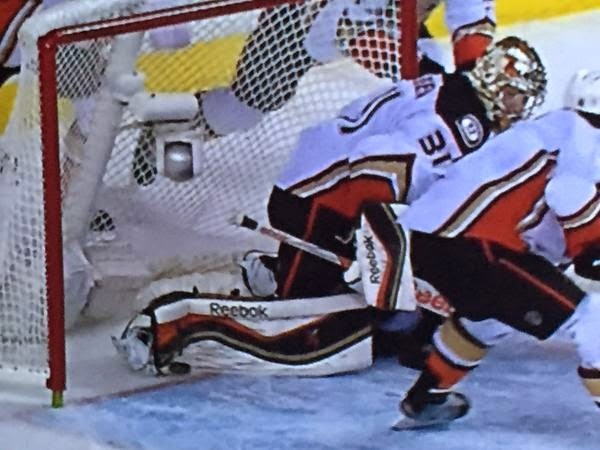 Meanwhile, I looked at things from the perspective of the Anaheim Ducks, who were 20 seconds away from a 3-0 series lead and instead find themselves one loss away from returning home tied 2-2. With those two items as your main entrees, here are four other side dishes from the evening. Darren McCarty was the last Flames player to score an overtime goal in the playoffs. How long ago was that? Well, consider McCarty hasn't been in the NHL for six years. McCarty's goal also came at the Saddledome and also came against Anaheim back on April 21, 2006. In game 1 of the first round series. McCarty beat Ilya Bryzgalov with the game-winner 9:45 into extra time. Assists went to Kristian Huselius and Daymond Langkow, also long gone from the NHL for three and four years respectively. "I didn't know what to do," said Backlund. "I thought for a second about doing a Theo Fleury (from game 6 in Edmonton in 1991) but he's a legend and I'm not really quite there." Had that happened, it didn't sound like Joe Colborne would have been that surprised. "When you score a goal that big, you just let the emotions go," said Colborne with a chuckle. Backlund's first career playoff goal came on his 28th shot of the post-season. That leads the team with the next closest player being David Jones, who is seven back. Backlund ranks 10th in the NHL. 2. Are You Going or Am I Going? Johnny Gaudreau, Sean Monahan and Jiri Hudler were already on the ice during what would turn out to be the winning sequence. But one more forward was needed when Karri Ramo hustled to the bench during a delayed penalty to Anaheim. As he approached the bench, both Colborne and Backlund were standing, looking at each other, both ready to spring over the boards. As Calgary maintained possession for an especially long time, Colborne said he was "jacked up" and ready to go. When the goal went in, the 6-foot-5 winger was over the boards in a heartbeat and one of the first to reach No. 11. "I already had one leg over the bench in case there was a guy changing," he said. "I chased him down as fast as I could. That might have been the fastest I skated all night." In 2004 when Martin Gelinas appeared to score the go-ahead goal with just over seven minutes remaining in game 6 of the Stanley Cup final against Tampa Bay, only to have it not count, Karri Ramo was 17 years old and playing in Finland. As if I need to remind anyone, the Flames went on to lose in overtime that night and then lost again in game 7. Ramo says he also knows all about the goal that all of Calgary has been angry about for 11 years because it was the Lightning that drafted Ramo the following June. Highlights from that Stanley Cup-winning season including that goal were shown often throughout Tampa Bay's next training camp. "I watched it during Tampa's camp, we watched it so many times, the whole final series and the playoffs. The moments and their journey there so we can try to learn from it," said Ramo. So I had to ask him, did they every come clean and admit it was a goal? "I don't think it's their job to admit it. It's not their decision. They can't really do anything," Ramo said with a smile. "I don't think it makes anybody feel better if (Dave) Andreychuk says I think it was in or (Nikolai) Khabibulin says so." Ramo says he's been on the other side before where his team won on a goal that replays showed went through the side of the net. "Those things happen many times in a game. Refs try to make the best of it. I'm sure the NHL tries to make the best of it," says Ramo. It was downright eerie how similar Sam Bennett's non-goal on Tuesday was to the Gelinas goal. Same camera angle, same situation of a shot that looked to cross the line before it was kicked out by an outstretched pad that was behind the goal line. In 2004, it was Gelinas from Oleg Saprykin. Tuesday it was Bennett from Jones. In this case, it would have tied the game with just over six minutes left. "You can see the comparison to 04 and what happened that time was pretty big. I heard the crowd start chanting something like 'It was in'," said Ramo, who knew exactly what the sell-out crowd was getting at. And by the way Karri, that's exactly what they were chanting and for a long time too. It was yet another showing of the undying loyalty of the fans to this charming team that didn't stop in those final six minutes and played at least a small part in spurring the Flames on to eventually get a tying goal that did count. "Obviously, they're not going to quit on us and we're not going to quit on them," Ramo said. "We go until the final buzzer of the last game of this year, We're going to give it all and they're going to give it all too." What more can one say about Johnny Gaudreau that hasn't already been said. The 21-year-old is clutch. In the moment last night, time ticking away, needing the perfect shot or the season would be on life support, the kid did it. Probably just like he's done several times through his minor hockey career, and maybe once or twice in college too, but this time on the biggest stage of all, he rips one over the glove of Ducks goaltender Frederik Andersen. Biggest goal of your life, Johnny? Well, 20 seconds actually as that 19.5 remaining is rounded up but small quibble, we get the point. While Gaudreau was doing his usual non-chalent thing, shrugging off the latest tying goal in a playoff game in franchise history as just an ordinary goal, no big deal, others were a bit more complimentary. "That's an all-world shot," Colborne said. "There was probably three or four inches there and Johnny just picked it." Bob Hartley also gave the kid some kudos post-game. "He's a big-time player. 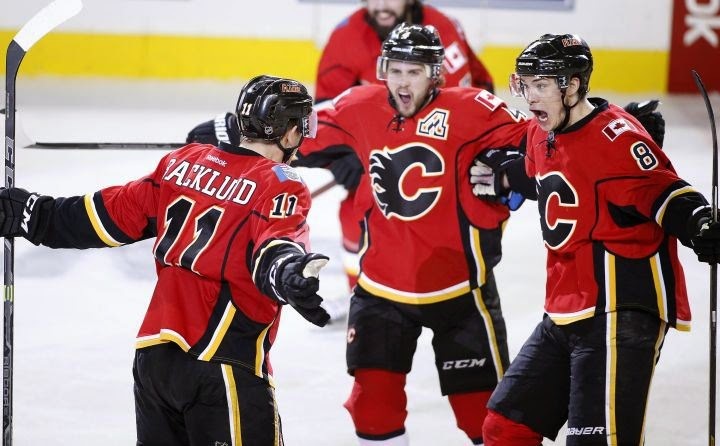 He wants the puck in those key moments," said the Flames coach.